It’s exciting to realise that this time next year, the first public realm areas to be delivered as part of Queen’s Wharf Brisbane will be buzzing with people! Foreshore South – which is the riverfront area between the Goodwill Bridge and 1 William St – will by then provide visitors and locals with what will be Brisbane’s newest inner-city park, waterfront walkways and an upgraded bikeway section. Work is on-track on these areas, which are expected to open in the second half of 2019. During 2018, the Multiplex team has been working to finalise key piling and foundation works on the Mangrove Walk, and the upgraded bikeway section. 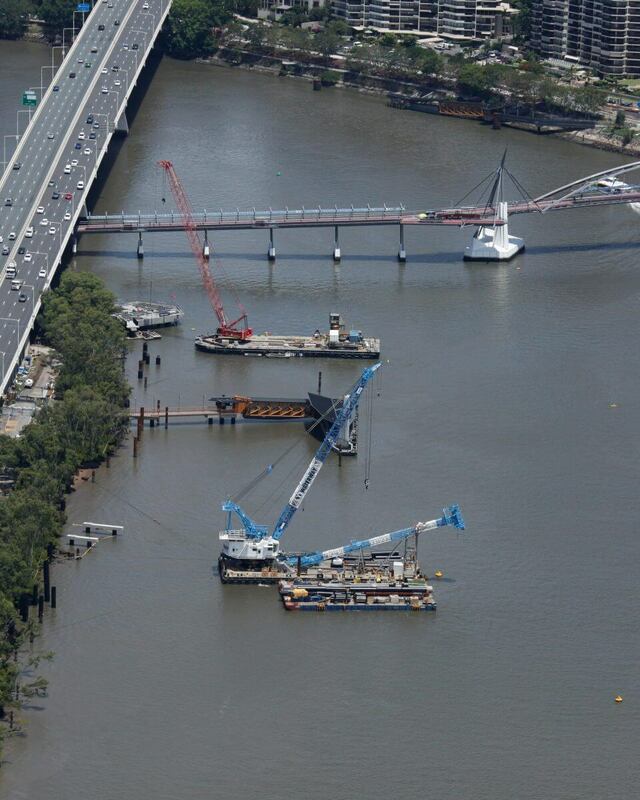 Using the marine piling barges along the river, workers have completed 63 marine piles and 30 micro piles and are progressing a new stormwater system for the precinct. Multiplex Project Manager Tyson McDonald said the first of two bio-retention basins to be located in the Waterline Park area has been completed and will use a combination of vegetation and filter substrate to treat stormwater. Meanwhile, early works have started on an exciting illuminated artwork feature that will be positioned in Waterline Park beneath the Riverside Expressway. In 2019, work will resume on 7 January and in the first quarter will include the completion of civil works, stormwater and services reticulation. Landscaping and planting will follow in the second quarter.